Hafttar’s offensive against Tripoli which seems to have bogged down or slowed down in the past few days, it is difficult to determine which, also worries the Americans, or so they claim. They express fears that it could lead to a wider conflict, another civil war in Libya. Laughably, the Americans, who destroyed the country, claim that only they can stop the violence and bring heaven to the hell they have created. The American pretext for having occupation forces in Libya is claimed to be a campaign to dislodge Islamic State elements in the country and to “maintained a special operations mission inside Libya that assists the government in counterterrorism efforts’ which is the language they use to justify all their illegal occupations of foreign countries. Yet, as the US does nothing to oppose the offensive, it continues to state it supports the government Haftar is attacking in Tripoli and continues to claim that Haftar’s actions could strengthen Islamic State in Libya. Just how Islamic State got from Iraq and Syria to Libya is a question to be asked, as is their presence in Afghanistan. The answer is that it is composed of the remnants of the forces sent in to Libya by the US and its allies to attack Ghaddafi as well as locals recruited in Libya that the US sent into to Syria to attack the government there. Their defeat by the combined forces of the Syrian Army, Iran, and Russia, the defeat of the US war against Syria, forced them to return Libya, or be sent to Afghanistan to further destabilise the situation there. Now it is claimed by the US and its Libyan puppets that certain armed groups are ISIS affiliates, but whatever the reality, once again the claim gives the Americans another pretext to keep their bayonets at the throats of the Libyan people. There are conflicting reports as to whether Haftar’s forces have captured Tripoli airport and the US seems to have doubts whether the man they flew in from Langley to help overthrow the Libyan Republic in 2011 can do the job. 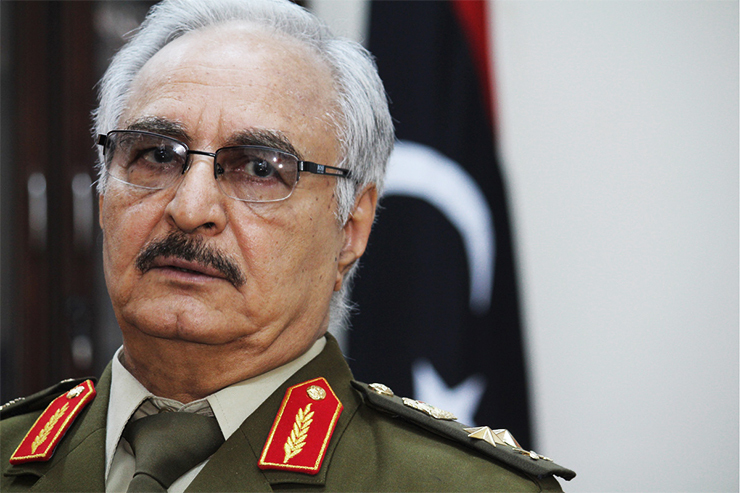 His army depends on support from local militias, which lack discipline and are notorious for war crimes and though Haftar claims to be against Islamists is supported by Salafist groups. On the other hand, like all the unsavoury characters working for the USA he is no democrat. He stated that Libya is not ready for democracy, echoing the US propaganda that Libya is a “failed state” instead of a NATO destroyed state, and, if the USA has its way Libya never will be a democracy, at least not the socialist democracy that was destroyed by NATO bombs and missiles. But to cover themselves, the New York Times, the mouthpiece of the US state, editorialised that sanctions should be placed on Haftar for “subverting a peaceful settlement of Libya’s problems and violating Security Council resolutions supporting the rump government he is attacking.” One has to wonder how loudly the writers laugh among themselves when they write this stuff since they were one of the big voices calling for the NATO attack on Libya and for Ghaddafi’s murder in 2011; for using war instead of peace. As for UN resolutions, since when has the United States adhered to them when it didn’t want to? They might as well call for sanctions on themselves. Meanwhile there is unrest in Algeria, unrest in Sudan and everywhere we see the dirty games of the French, British, Americans Italians, resurrecting the scramble for control of Africa’s resources that first took place in the 19th century. We have seen what their wars have brought to Africans from Rwanda to Congo, from Mozambique to Angola. There were the “colour” uprisings in Egypt, Tunisia, and now, in Algeria, there are protests against the ruling National Liberation Front (FLN) and claims of corruption and failure to deal with unemployment and rising prices. The protestors in Algeria are demanding that all the old heroes of the fight for liberation against the French in the 1950’s and 60’s be swept away. The army and political leaders have acceded to the demands. The president, Bouteflika, has stepped down, more opposition parties have formed and new elections scheduled for July. However the army chief of staff warned that foreign actors are behind the protests, meaning France and the USA, and that the problems of Algeria cannot be solved by violence and the destruction of the independence they fought for all those years ago. But with the forces of the US Africa Command and the French Foreign Legion positioned in a belt across the Sahel from the Atlantic to the Red Sea, and with Chinese forces entering Somali and Russian elements also becoming active and the British playing games in their former colonies, we can expect nothing but more turmoil and violence as these nations fight against the peoples of the Africa and fight among themselves for the spoils of war as the scramble for Africa is renewed.